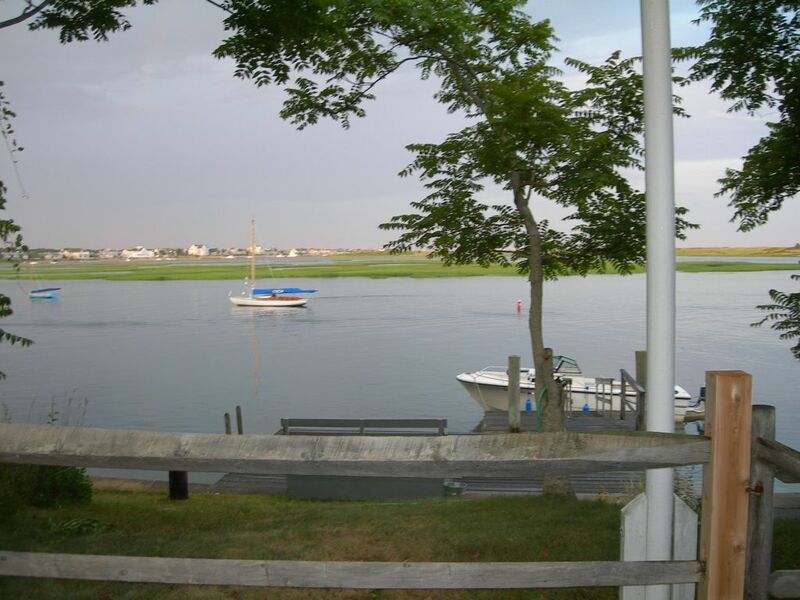 Waterfront Cottage - Bass River bacino di acque profonde incluso Nantucket Sound Views! Portate la vostra barca e legare per una settimana per alcuni dei migliori pesca a Cape Cod. O semplicemente rilassarsi e guardare il mondo deriva da, mentre i bambini costruiscono castelli di sabbia, granchi cattura, raccogliere conchiglie, o imparare a navigare o riga. Ponte lungomare spazioso perfetto per sdraio, prendere il sole, e la lettura. Se stai cercando il perfetto luogo di vacanza in famiglia, senza tutto lo sfarzo, e dal trambusto, vedere se questo cimelio di famiglia è per voi. Se siete stanchi di questi piaceri semplici, si è a pochi minuti di distanza da Hyannis zona centri commerciali, traghetti, il whale watching, ottimi ristoranti, campi da golf, piste ciclabili, tema mini golf, spiagge pubbliche, gabbie di battuta, guida gamme, parchi acquatici, e Parchi nazionali. The cottage itself is old and quirky, but the dock is to die for. You can spend the whole day there. We keep coming back for the view of Stage Island and the back side of West Dennis Beach from the dock. There are steps down to the water to take a swim. You can sit and watch the boats go by while you read and work on your tan. Bring your boat and it's a short ride out to Nantucket Sound. Great place to kayak! You can fish from the dock, or watch the ospreys fish. The cottage, though unrefined, is well equipped with a grill, outdoor shower, washer & dryer, lobster pot and crackers and picks, toaster, coffee maker, microwave. There is Direct TV, a DVD player, WiFi. Also puzzles, games, and books. Really everything you need. But the dock is what you need most. The cottage was everything that we hoped it would be. Charming quirky antique cottage with a huge screened in porch, a quiet wooded setting, a great outdoor shower, and a spectacular private dock near the mouth of the Bass River. We watched the boats go by, swam, kayaked, and fished. There are water views from the porch, living room, and master bedroom. And it’s centrally located, so nowhere on the Cape is that far away. Jon was great, very responsive to the couple of questions I had. We hope to stay there again! What a great property and all around experience. The cottage is great and very functional, the river and dock is spectacular, and the location is perfect for everything the area has to offer. We had a superb time. Thanks Jon! I have dreamed of staying on Bass River with my own boat and a deep water dock between the wind mill and the mouth of the river since 1975. This is one of the most beautiful places on earth. Having coffee on the dock at sunrise and watching the fishing boats go out is a picture I will hold in my mind forever. The cottage is comfortable and one begins to feel at home in no time. The owner is friendly and helpful. I would recommend this to anyone who wants to rent what it is. If you want a Hilton at the yacht club stay elsewhere. We arrived at the property and were disappointed with the condition of the place.the property was rundown and there were cleanliness issues. The oven was dirty as well as some dishes in the cabinets. The box springs were stained. Although stated the dock was 200 yards from the house, it did not say is was down a driveway and and across the street, we felt this was misrepresented. As a result we did not even stay there and went to a motel. This is the first time in 30 years this has ever happened. we going to chalk this up to some bad luck but we still did not get back our security deposit after asking 4 times, from the home owner. We did not even stay here so there was no chance fro any damage. Unfortunately our guest did not notify us via phone, email or text that they were dissatisfied during their 3 day stay in mid-October, until early in December when they first wrote the review. We have shared our vacation home and waterfront property with hundreds of satisfied guests and families since 1999, Spring, Summer and Fall. The home is professionally cleaned after each guest has departed, however if we receive timely complaints, we will respond quickly and re-dispatch the cleaning team at the guests' convenience to correct the issue. The damage deposit was not withheld and was refunded in full. volendo troppo sole. Abbastanza vicino alla città e centri commerciali, ma privato zona residenziale a differenza di alcuni luoghi di vacanza. Non c'è bisogno di partire per attività di intrattenimento e di acqua di proprietà, la maggior parte dei nostri ospiti passano il loro tempo giù in acqua. Eppure, se siete appassionati di grandi spiagge pubbliche la casa si trova in posizione centrale a Cape Cod e perfetto per gite di un giorno a P-città, Hyannis, Chatham o di molte altre avventure nelle vicinanze. Il Giuda Baker Windmill è un isolato a nord della casa e il quartiere tranquillo vanta alcune antiche case del capitano. Il Great Island Bakery, a pochi passi dalla casa è il luogo ideale per prendere un caffè e Pecan panino se si arriva abbastanza presto.